With his non-dogmatic views, Attila Hildmann represents a new generation of people who want to eat healthy foods that are free of factory farming and products manipulated by the food industry. He believes that everyone who eats vegan one or two days a week or has one vegan meal a day will experience significant health benefits and a greater quality of life. The best example of the healthy benefits of a vegan diet is Attila Hildmann himself. He went from being a significantly overweight young man, who as he today says lacked motivation, to a model athlete full of energy within just a few years. Attila is even able to easily conjure up hearty flavors like those you are familiar with from meat. And his recipes are often incredibly simple. Many of the recipes work well as snacks or for the office, and they’ll add healthy variety to your diet. After trying recipes like vegan burgers, spaghetti carbonara, cashew ice cream, pralines, and tasty smoothies, people with a normal diet will soon become fans of healthy foods that don’t contain cholesterol, hormones, antibiotics, flavor enhancers, or other additives. Attila Hildmann was born in 1981 in Berlin, where he still lives today. Since "Vegan for Fun" was released in 2011, he has revolutionized the German-language cooking and diet book market, which is the second largest in the world after the U.S. Attila is now one of the most popular talk show guests and can be seen in the media almost every day. His own transformation from a lazy chubby guy (Attila about himself) to a model athlete in top physical form has led people to follow his example—after all, it was his father’s early diet-related death that motivated him to take action. Attila lost over 77 pounds without going hungry, but rather by slowly cutting out animal products and completely changing his eating habits. 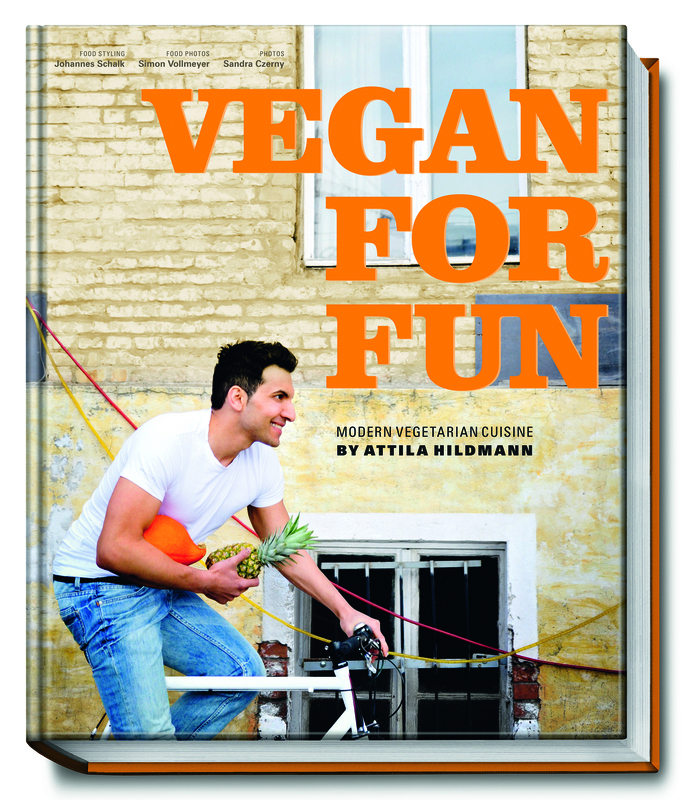 With his bestsellers "Vegan for Fun" and "Vegan for Fit", Attila started a trend unprecedented in Europe. Never before had a vegan cookbook been Number 1 on bestseller lists, and it was also the bestselling book on amazon.de. Thousands of people have been motivated by his idea of a 30-Day Challenge. They have experienced how dramatically their physical and mental well-being have improved as a result of giving up animal products and integrating a balanced exercise plan into their lives. Attila Hildmann’s recipes are inspiring huge numbers of people who always wanted to do something for their health, but were never able to follow through. The aspiring physicist and fitness fan has revolutionized vegan cuisine with his message that a vegan diet is not only healthy, but also full of variety, creative, and delicious. Simon Vollmeyer began studying chemistry, but soon found that he was much more fascinated by photography. Vollmeyer completed his training as an advertising photographer at a large photo studio in Northern Germany. He later became the head of this studio, which was one of the first studios for digital photography in the country. Since 2001, he has worked as an independent photographer in Berlin. Johannes Schalk did an apprenticeship at Studio Seekamp Bremen, one of the largest photo studios in Europe, to become a photographer. After his training, he mainly worked as a food photographer, and over time, discovered his talent for food styling. He also trained to be a cook at Maritim pro Arte Berlin and started working as an independent food stylist in 2007. His customers have included companies such as Campari, Skyy Vodka, easyJet, and Subway.